Watercolour paint is made up of pigments and a water-soluble solution. This means that as you add water to them, they spread out and become easy to paint with. They tend to start in a solid block, but as you add water to them, they form a watered-down pigment appearance. Watercolour painting is a delicate art, too much water and it's ruined and not enough and you won't get the desired effect. 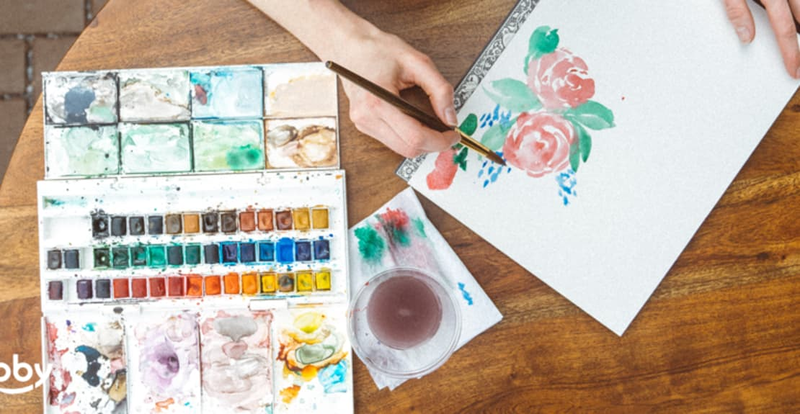 The strength of the colour of watercolour paints is determined by the amount of water used, and the paint can be built up on top of each other although less so than oils and acrylics. The most common surface to paint onto with watercolour is paper. This paper often contains a level of cotton thread which gives a good texture and reduces distortion of the colour. Watercolour painting has a rich history, owing its popularity in the UK to education. During the 18th century, being able to paint in watercolour was seen as being a product of good education amongst the aristocracy and middle class. Not only that though, as watercolour came hand in hand with exploration and discovery. Watercolour artists were often taken along on various expeditions to documents new plant species, animals and terrain discoveries. Still to this day in schools, textbooks will contain historical watercolour (now printed versions) paintings to symbolise new discoveries that England's explorers found during its colonisation. Artist wise, there are three English painters that stand accredited for establishing watercolour and an independent and mature medium rather than just a documenting medium. Paul Sandby, who is often referred to as the "father of the English watercolour" is the most famous of those. The other two being Thomas Girtin and Joseph Mallord William Turner.